His Holiness the 14th Dalai Lama at the College of William & Mary. What an amazing opportunity! 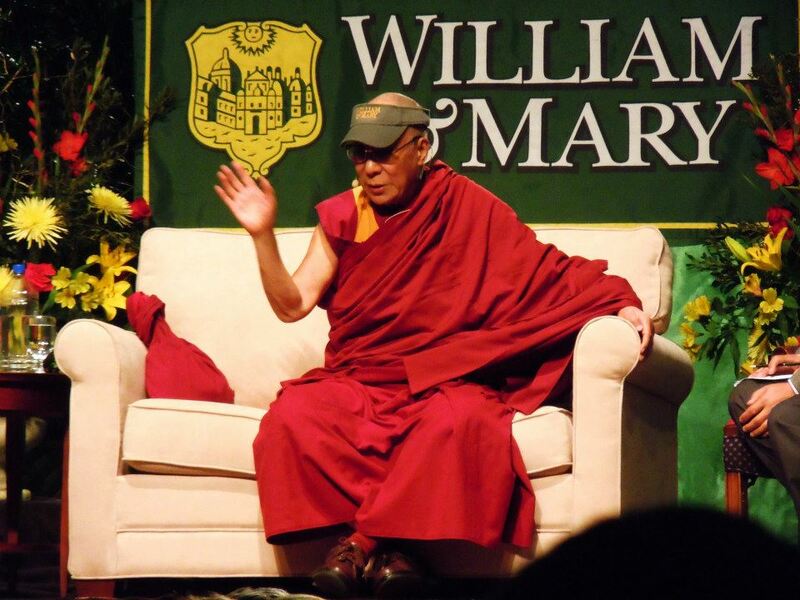 Today I got to meet His Holiness the 14th Dalai Lama when he came to speak at the College of William & Mary, in Williamsburg, VA. Often viewed as the world's most important peace leader, he is the author of 72 books, winner of the 1989 Nobel Peace Prize, and leader of the Buddhist world. I'm still in awe after hearing him speak on compassion, common humanity, and inner beauty. What an honor! Very cool! Did you take any notes? Any favorite quotes or parts of his speech that you liked best? I did not take notes, though I managed quite a few pictures. My favorite part? Hmm...Hard to say, but I really liked his discussion of how humans are unique in that they have the ability to extend compassion to even their enemies. He said, "We all have by nature the sense of love ... we can extend our love and compassion infinitely." Infinite compassion. Nicely put.